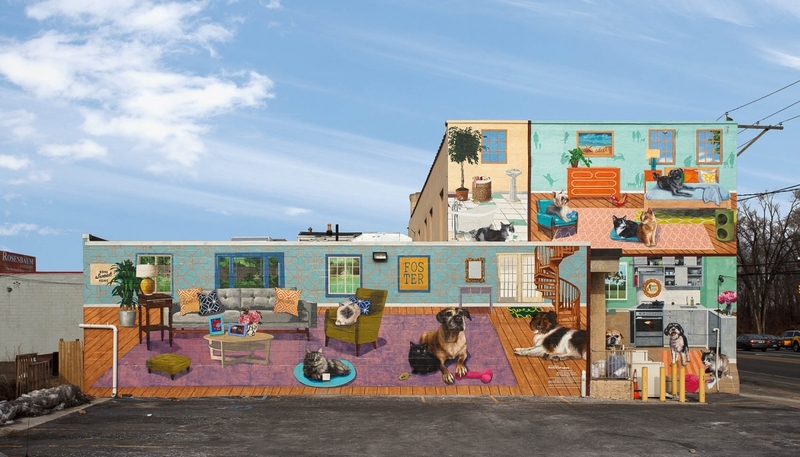 The Philadelphia Animal Welfare Society (PAWS), together with the City of Philadelphia Mural Arts Program, dedicated two murals which depict rescued animals living in the safety of home, to promote PAWS’ efforts to save Philadelphia’s homeless pets. 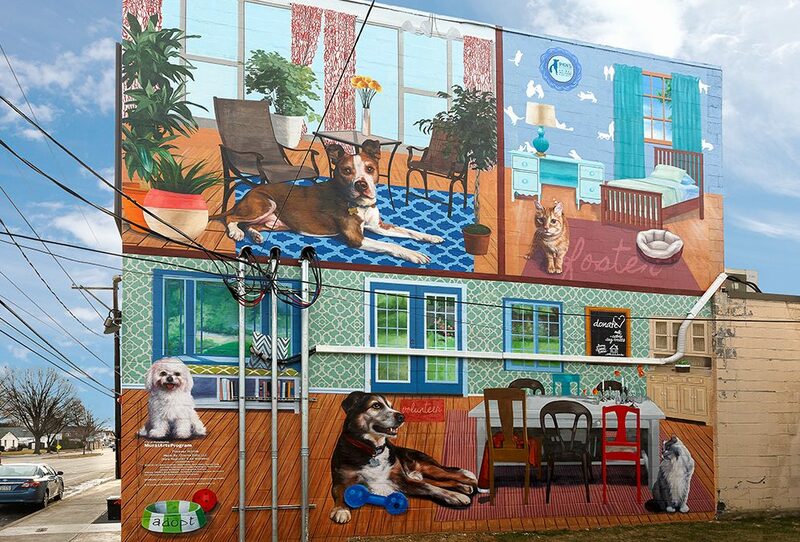 Created by artists Ali Williams and Kala Hagopian, known as Chroma Dolls, the murals feature pets who once lived on the streets or in shelters and now have loving families. The murals were made possible thanks to the generous support of those families, many of whom are PAWS adopters, volunteers, and fosters. The murals are installed on PAWS’ newest facility, an Adoption Center and Low-Cost Clinic at Grant and Bustleton Avenues in Northeast Philadelphia. Since opening in May, it has enabled PAWS to rescue an additional 400 animals and provide spay/neuter surgery and other clinical services to more than 4,000 dogs and cats belonging to disadvantaged pet owners who would not otherwise have been able to access care. The December 14 program included remarks from representatives of PAWS, Mural Arts, and the community, and was followed by a ribbon-cutting ceremony and refreshments inside PAWS’ adoption center. Read more about the mural in Philadelphia Magazine. PAWS is a 501(c)3 non-profit organization dedicated to saving Philadelphia’s homeless, abandoned, and unwanted animals.  PAWS is the city’s largest no-kill shelter and operates two high-volume, low-cost spay/neuter clinics serving pet owners and rescue organizations that lack access to affordable basic veterinary care. Through its adoption locations, special events, and foster care network, PAWS finds loving homes for thousands of animals each year. Support for PAWS funds lifesaving initiatives which help reduce and will ultimately eliminate the unnecessary killing of animals and make Philadelphia a place where every healthy and treatable pet is guaranteed a home. The City of Philadelphia Mural Arts Program (Mural Arts) is the nation’s largest public art program, dedicated to the belief that art ignites change. For 30 years, Mural Arts has united artists and communities through a collaborative process, rooted in the traditions of mural-making, to create art that transforms public spaces and individual lives. Mural Arts engages communities in 50–100 public art projects each year, and maintains its growing collection through a restoration initiative. Core Mural Arts programs such as Art Education, Restorative Justice, and Porch Light yield unique, project-based learning opportunities for thousands of youth and adults. Each year, 12,000 residents and visitors tour Mural Arts’ outdoor art gallery, which has become part of the city’s civic landscape and a source of pride and inspiration, earning Philadelphia international recognition as the “City of Murals.” For further information, call 215-685-0750 or visit www.muralarts.org. Follow along on social media: @muralarts on Twitter and Instagram, phillymuralarts on YouTube, and MuralArtsPhiladelphia on Facebook.